Send resume to customers from applicant’s card! It’s almost summer and PersiaHR team is gaining momentum! We share with you another update in the system which will simplify your communications with customers. 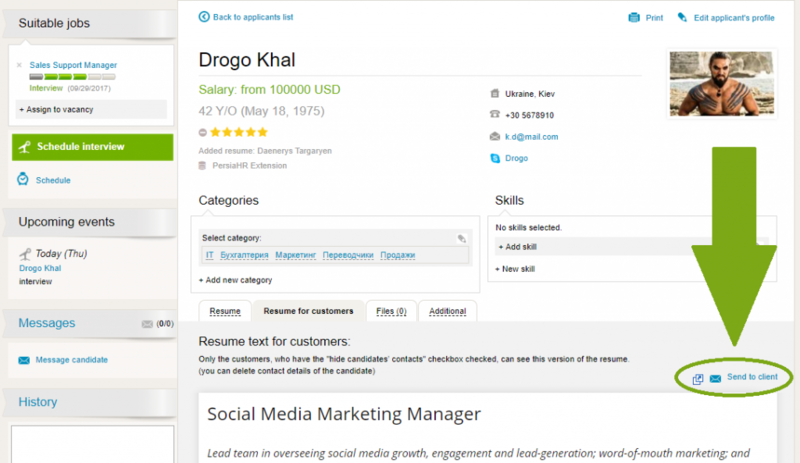 Now you can send resume to customers directly from applicant’s card page! 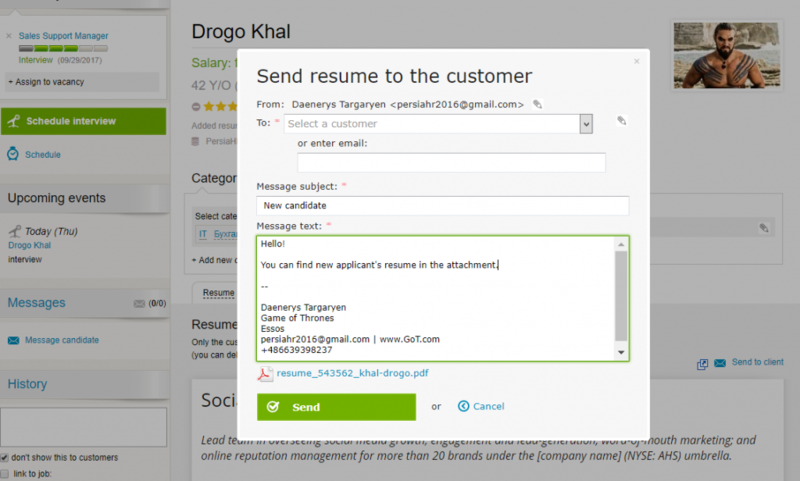 To use this feature, you need to go to card of applicant whose resume you want to send to the customer. Go down the page to resume block. Here you have the opportunity to create a resume for the customer. 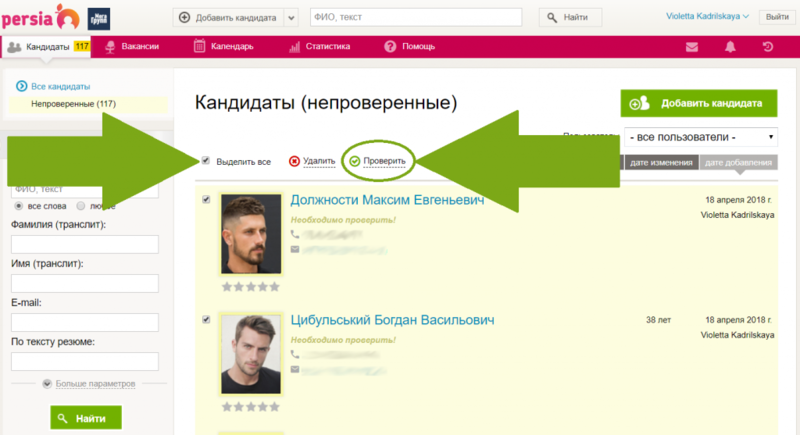 For more information on how to do this, see the article «How to hide applicant’s contact information from the customer». After resume is created in the upper right corner of the block click Send to customer button. You will open a window with letter template and attached PDF-resume which the system itself has generated. You can check if the information in resume is displayed correctly — just click on it, download the file and open it. Next you need to fill out the field with customer’s e-mail address. If the client is connected to your account, select him from the list or manually enter the email address. To quickly connect the customer to your account, click on pencil icon next to e-mail field. Then specify the subject line and write covering text. We draw your attention: system will offer you a template for cover letter by default. If necessary, you can change it in Message templates section. And in Account data section you can edit your signature, add or remove contact information. After all the fields are filled, click the Send button, and customer will receive the message with chosen applicant’s resume. In addition, this action will be displayed in History on applicant’s card page and in Journal. We are sure that this new feature will simplify your work with clients and will promptly inform them about appearance of appropriate candidates for their jobs! For more information on how to work with customers from your account in PersiaHR see our video. Good day, dear users! PersiaHR team is on the line and we want to share some useful updates in our system with you. First update is related to applicants database. Now you have the opportunity to review several resumes at once and save them to your database in a couple of clicks.
! 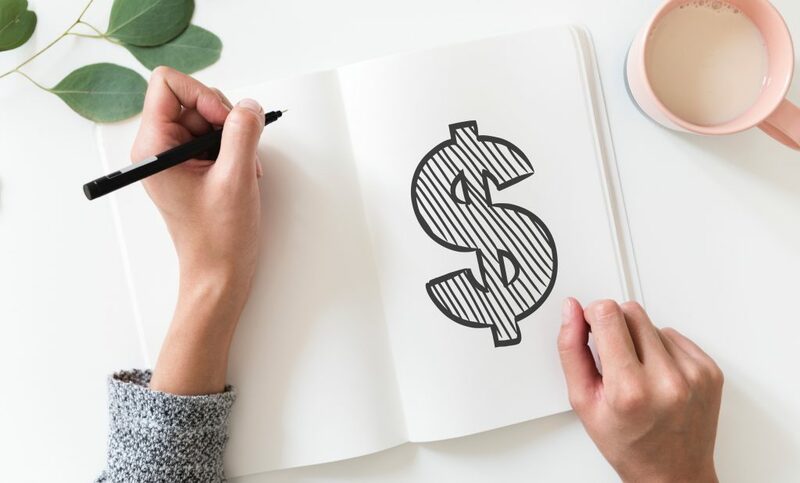 We remind you that you can set up your account and receive resume responses from job boards and e-mail straightway to your common applicants database. Also you can upload multiple resume files using the archive. When new resumes get to database, they are highlighted in a different color and are marked as files that «must be reviewed». Now all the new responses can be added to applicants database in a couple of clicks and this will save your time on processing resumes. It’s very easy to do this! First go to Applicants section. In the upper left corner, select Unverified, then tick the checkbox next to «Select all» or select resumes manually. After that, click Review button. Voila, all new resume were added to your applicants database !
! If resume has unfilled obligatory fields, system will inform you about it. In this case, you need to manually enter necessary data and save resume in the database. Second update is related directly to applicant’s card. Now you can see the source from which resume was added to database on the page with applicant information. In addition, this information can be edited or you can add your own source, for example, if resume came to you on colleagues recomendation. To specify the source manually go to editing mode of applicant’s card and select necessary item from the list in Source field. If you did not find needed source, specify your own one, using Add new source button. We believe that these updates will be useful and will help to make your work more productive! Also we will be glad to hear your feedback and suggestions about PersiaHR.